Lists about the best Christmas movies always feature a couple of titles that seem odd picks at first glance. Die Hard for instance, but another title that always pops up on these lists is Gremlins: a horror comedy about a bunch of violent little creatures that wreak havoc in a small idyllic town on Christmas eve. Even though it was released in the summer the whole movie has a festive holiday atmosphere to it as the small town of Kingston Falls is covered in snow and Christmas decorations, a Christmas song plays over the opening credits and Corey Feldman at one point dons a Christmas tree suit. It should come to you as no surprise that by the end of the movie, all three rules have been broken. Gizmo, the Mogwai Billy receives as a present, is a cute and mild mannered little creature who displays above average intelligence as he’s able to make short sentences. At one point rule #2 is broken and Gizmo gets wet which results in a couple of furry balls popping out of his back resembling something the cat coughed up. These hairy balls quickly turn out to be Mogwais who apparently multiply when they come in contact with water. The downside to this is that Gizmo’s offspring isn’t as mild mannered as he is, making them not so ideal pets. When these new Mogwais eat something after midnight they turn into big slimy cocoons as they enter a pupal stage. After they have hatched from their cocoons, their appearance is vastly different as they have turned into scary monsters with sharp claws. 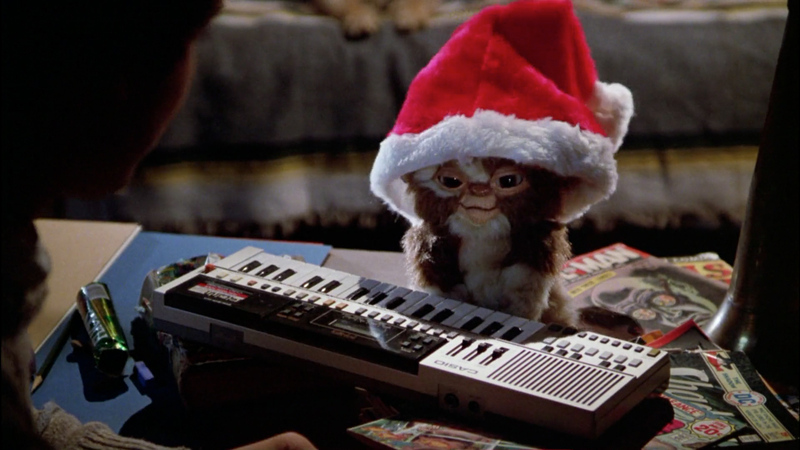 Gremlins is a fun movie and there is a certain approach to the material where everybody seems to be in on the joke. All of the characters in the movie are one-dimensional stereotypes. Billy is the clean shaven protagonist, Pete the smart mouthed boy next door, Mr. Futterman the grumpy next-door patriotic neighbor and Ms. Deagle, a secondary antagonist who’s very wealthy and owns a lot of property in Kingston Falls. Her attitude resembles that of Ebenezer Scrooge a lot. It’s Ms. Deagle who is also the most cartoonish character of the movie as she’s constantly in a bad mood and at one point threatens to kill off Billy’s dog in a gruesome manner with the guy behind her just nodding his head saying “That’ll do it alright”. The only person that isn’t completely one-dimensional is Kate (Phoebe Cates), who has a tragic backstory about her dead father. It’s a bit over the top and rightfully spoofed in the sequel. 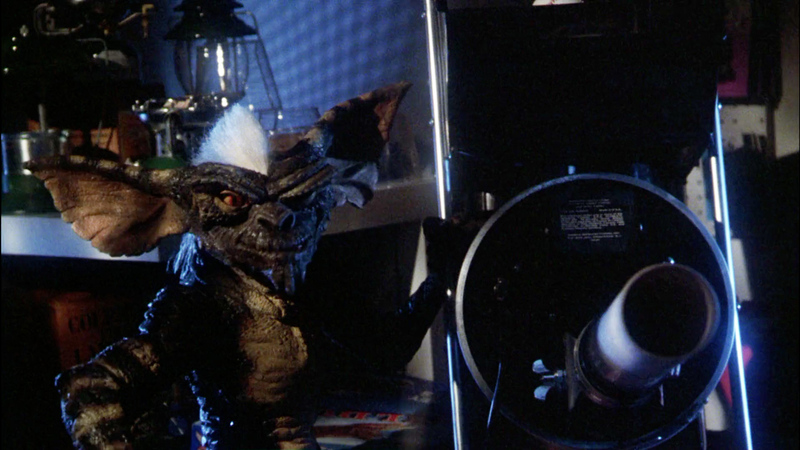 A big part of what makes Gremlins so great are the creatures. Because it was released in 1984 all the effects are practical. 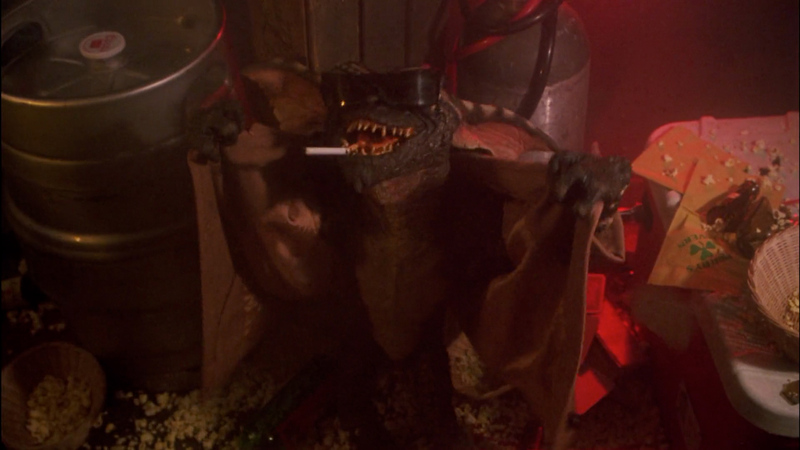 Every Gremlin on screen is either an animatronic or a hand puppet. Would this movie have been made today a lot, if not all, Gremlins would be computer generated. Even though the budget wasn’t that big, the effects still hold up after more than 30 years, except for one stop-motion scene. The only remark I have on the creature design is that even though there are hundreds of them, they all look alike. Only Stripe, the leader, is distinguished by a white mohawk. They changed this in the sequel by giving all the creatures distinctive features, though it’s up for debate if they went overboard with it or not. That movie did have one fully electric Gremlin after all. I also love the cinematography of the movie. The Christmas lighting in the outdoor scenes really gives the movie a great atmosphere. Most horror movies from the 1980’s were pretty dark, but Gremlins is more of a horror movie which is targeted at the entire family. Gremlins was one of the movies that was responsible for the creation of the PG-13 rating. For a movie that seems to be targeting all ages there are some scenes that the really young viewers might find somewhat disturbing. Especially the scene in which Billy’s mom discovers the cocoons have hatched and is attacked in the kitchen is filled with some pretty nasty moments like when she puts a Gremlin in a blender and has one explode in the microwave. I must note that Billy’s mom sure knows how to defend herself against these creatures. While most women are afraid of something so small as a spider, Billy’s mom attacks these creatures head on with everything she’s got. 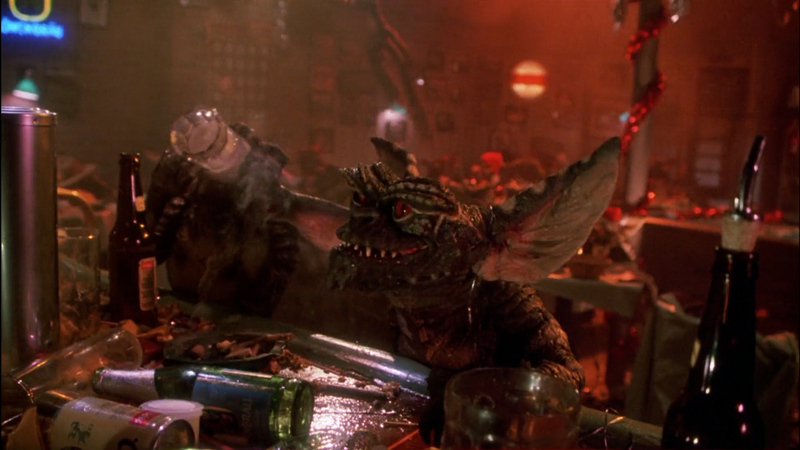 I also want to mention Kate who in a bar filled with Gremlins still manages to stand her ground. From a feminist point of view Gremlins has some strong female characters. Gremlins is in my book one of the iconic movies from the 80s. It belongs to that category of 80s classics that are able to stand the test of time. A couple of other movies belonging to this group are Ghostbusters, Back To The Future, The Goonies, RoboCop, Die Hard and Predator. All movies that were a part of my childhood and which I still enjoy watching today as much as I did back then.